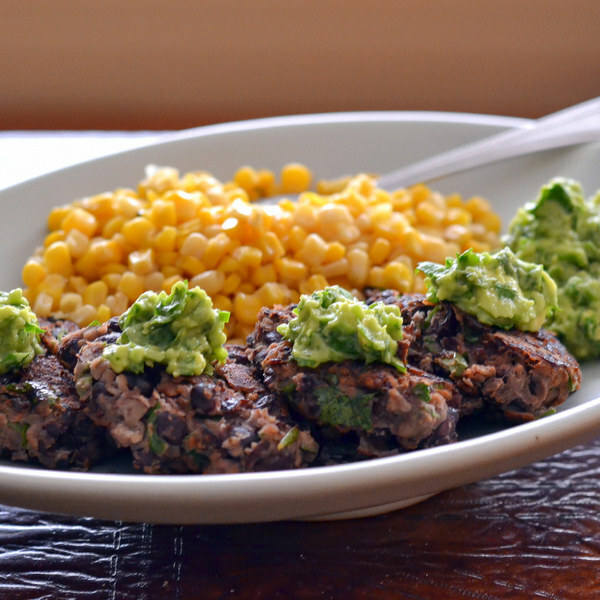 ← Southwestern Black Bean Cakes with Guacamole & Corn. Wash and dry jalapeños and cilantro. Seed and mince jalapeñso. Shave cilantro leaves off the stems; discard the stems and mince the leaves. Transfer beans to a large bowl and mash with a fork. Add eggs, jalapeños, ½ of the cilantro (save the rest for the guacamole), bread crumbs, cumin, salt, and pepper. Mix until well combined. Halve and pit avocados; scoop out the flesh into a medium bowl. Add remaining cilantro, lime juice, salt, and pepper. Mash with a fork until smooth. Coat bottom of skillet with oil. Add corn and cook until heated through, 2-3 minutes. Transfer to a bowl. Shape black bean mixture into 12-16 patties and place on a plate. Once corn has been transferred, wipe skillet and coat with more oil. Working in batches, add patties and cook until browned and crisp, 3-4 minutes per side. Peel and mince garlic. Add garlic, lime juice, salt, and pepper to corn; mix to combine. Serve black bean cakes with guacamole and corn. Enjoy!